Let your lights start thinking for themselves with Lighting Pro! 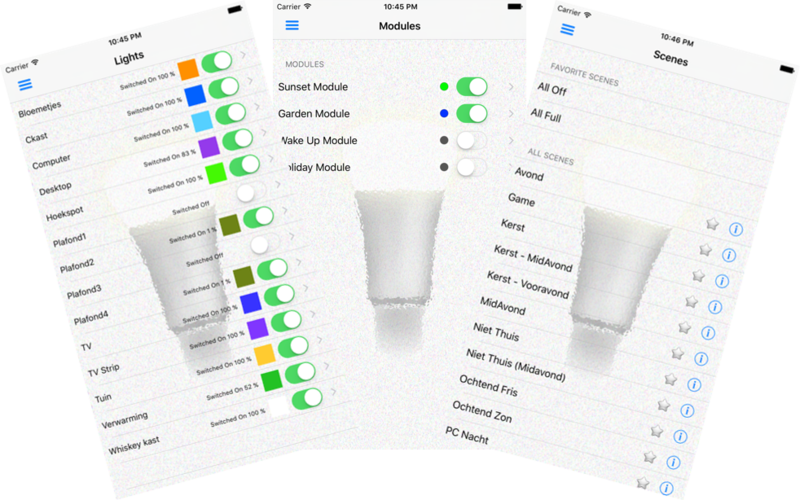 With Light Control, you will be able to automate all of your Philips Hue lights. You can let your indoor lights go on at a specified time before sunset and let them change during the evening, as it is getting darker outside and cosy inside. Control your lights, scenes and rooms. Or set them up and use them within HomeKit. Lighting Pro comes with smart modules. Sure it’s nice to use schedules events to switch your lights on at a certain time, however the sunset changes each day. So wouldn’t it be nice to control your lights relative to today’s sunset?! With Lighting Pro you can! Don’t have a 9 to 5 job but working in shifts that may differ each day? You’ve probably added them to your calendar. Let Lighting Pro know how much time before your work you’ll get up and how much time you need to travel. Lighting Pro will have your lights switched on when you wake up and switches them off when you walk out of the door. Leaving for Holidays? Lighting Pro will make it look like someone’s at home and let you even use a TV Simulator so it looks like someone is watching TV. With the separate Lighting Pro Remote Controller, you can even control your lights and settings when you’re away. 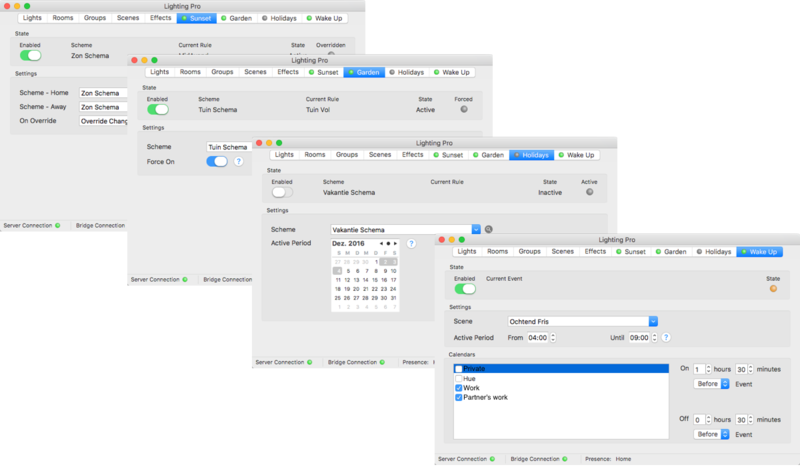 To get the best out of Lighting Pro, it’s preferred to run on a Mac which is active 24/7. In case you aren’t able to do so, Lighting Pro can transfer the schedules events into your bridge for up to a week. Some features, like the Remote Controller will only work when the Lighting Pro app is running and reachable though. In case you do run it for 24/7 on a Mac stashed somewhere on your attic, you can install Lighting Pro on your other Macs as well as a Client installation. That way you can control your server/lights from any other Mac, without the need to use any kind of Remote Desktop. 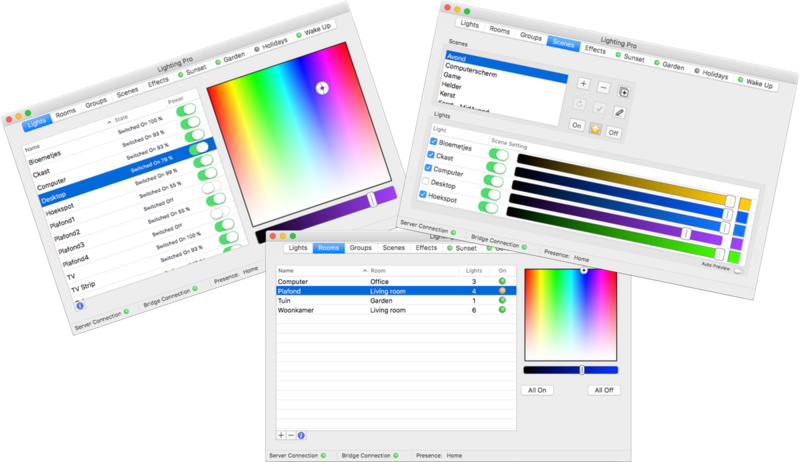 In case you don’t need all of the smart stuff, but just want a lightweight app to control your lights when you’re working on your Mac, then there’s also the Lighting app.